The Playwrights Project was a short-term ensemble project bringing together a small group of actors, two playwrights, and a director/deviser in a temporary ensemble to develop and present new work at various points in the development process. 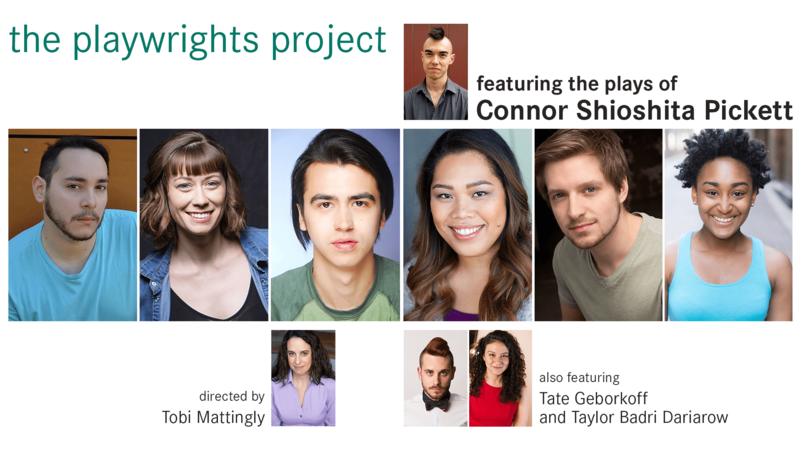 The project was produced by Artistic Conspiracy, and Phase One (An Evening of Plays by Connor Shioshita Pickett) was presented in a special collaboration with Haven Theatre as part of their Spotlight Series. The final phase of The Playwrights Project was a full production of Chicago Afterdark by Tate A. Geborkoff. SHOOTBALL – In a deconstructed game of baseball, two siblings challenge their late brother’s friend to hit the signature pitch he taught them. Throughout the game, they excavate the circumstances of his death and turn over the new power dynamics in their little triangle. COWBELL vs. SADNESS in PUSHUP COURT is a pair of micro-plays concerning Cowbell, a heartbroken young man exploring extreme remedies for his ailment. His mentor, Mr. Leland, leads him to an unexpected and bittersweet solution (mostly pushups). THE ICE SCULPTURES explores three individuals’ perspectives on the country they left and the new country which has left them broke, isolated, and disappointed. Two close friends make ambitious real-estate transactions over worthless property; a distant stranger conjures the bleak, absurd circumstances that drove them all from their home country. BEWARE WOMEN is the story of Maria Middleton and the historical Hatpin Peril, an early-20th-century trend of strong-willed women violently resisting street harassment and assault. When a Chicago alderman bans the hatpins as well as the heroine, Maria and a mysterious anarchist rebel pursue an ambitious revenge inspired by Jacobean tragedy.